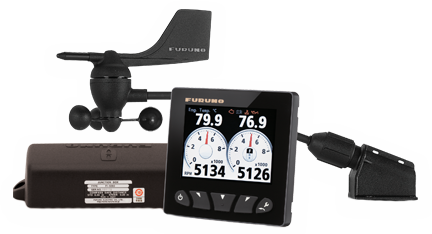 Our professionally designed FI70 instrument series is designed to meet the needs of sail boaters and power boaters alike, offering an economical solution to display wind speed and direction. The FI70BW package consists of the FI5001 Wind Sensor and FI70 Digital Data Display, and includes the IF-NMEAFI Analog-NMEA2000 converter as well as the FI5002 Junction Box. Together, this package provides for a simple installation and full compatibility with other navigation equipment. Whether you use these instruments by themselves or as a part of your NavNet system, the FI70BW will add both function and beauty to your helm.